In an industry where we making our living assisting clients with their Microsoft applications, such as Excel, Access, Office, SQL Server and Power BI, having that Microsoft Certification for an amazing 23 consecutive years is that much more meaningful than any other form of certification, such as the Better Business Bureau. 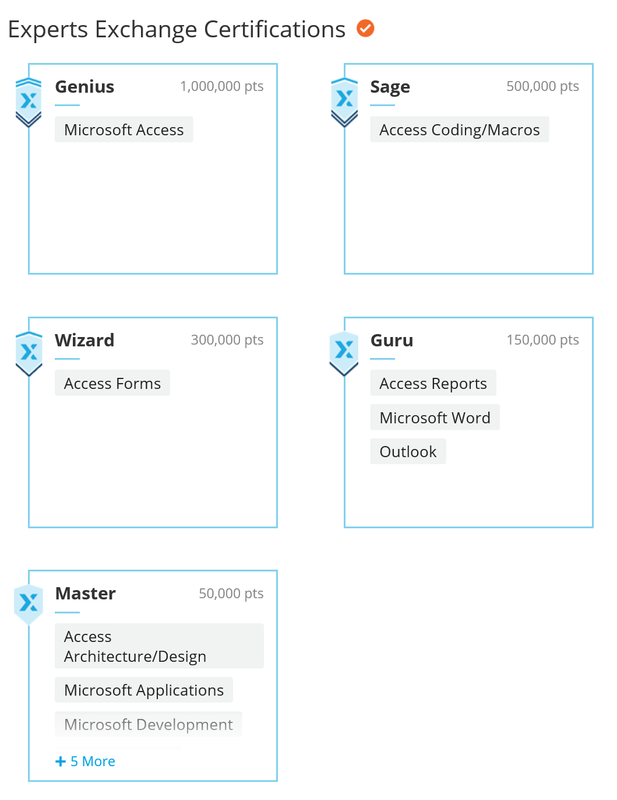 Having Microsoft’s Application Developer Certification is Golden. And only a handful of firms in our industry have it more than twenty years, twenty plus years and thousands of happy clients served, that is what matters. WARNING: Make sure that the firms you are speaking to are truly a Microsoft Certified Partner. To do so just ask for the link to the Microsoft website where their Microsoft Certification is posted. 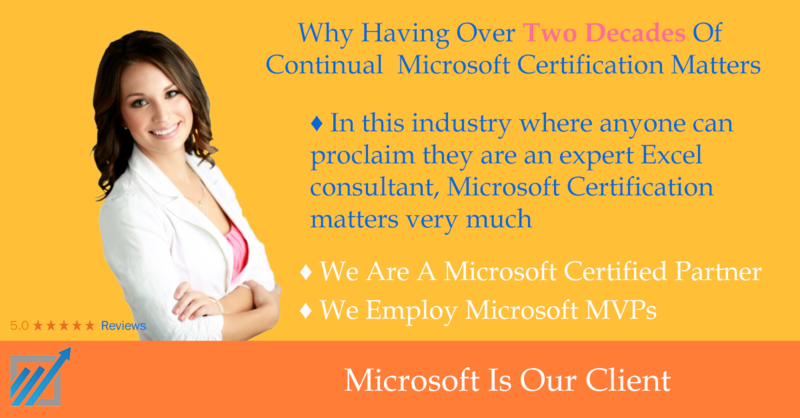 See our Microsoft Certification Page on the Microsoft website. As Amazing as it is, as of 2017 we have 23 of these on our wall in our Irvine California office. Is Your Newly Hired Microsoft Excel Consultant Really A Qualified Microsoft Excel Expert – Are You Sure? Here is a point that would make a person searching for a good Excel consultant nervous, in an industry where anyone, and literally anyone, skilled or not can call themselves an expert Excel consultant, things can go terribly wrong, (100% of payments lost on a useless application, valuable time lost waiting for it to be developed), so two or more decades of Microsoft certification matters very much as it means you are hiring a reputable firm. One that passes the certification of Microsoft. Think about it this way, say you for instance are an electrical engineer, and you want to get work as an independent Microsoft Excel consultant. It is not hard to do, even if you have never even opened Microsoft Excel. How can I say that, easy. Here is how you get there. 1) Buy a website URL on GoDaddy, say for example, freds-excel-consultancy.com. 2) Open a website hosting package on GoDaddy. 3) Place a WordPress website template on your site. Place a bunch of false claims, by copying what your competitors place on their websites. 4) Create a few Goggle AdWords ads. 5) When a lead calls or emails you, say that you have 25 years experience developing custom Microsoft Excel workbooks for S&P 100 companies. True, it is a complete lie, but they won’t know that, so take their money, don’t do the work, and then never respond to their calls or emails again. Done. So in the story above, you just did what many of the newer people in this field do, they make claims that are often 100% false. Why not, who will know, they copy what the leading firms in the industry post on their site, and they put it on their site. It happens all the time. 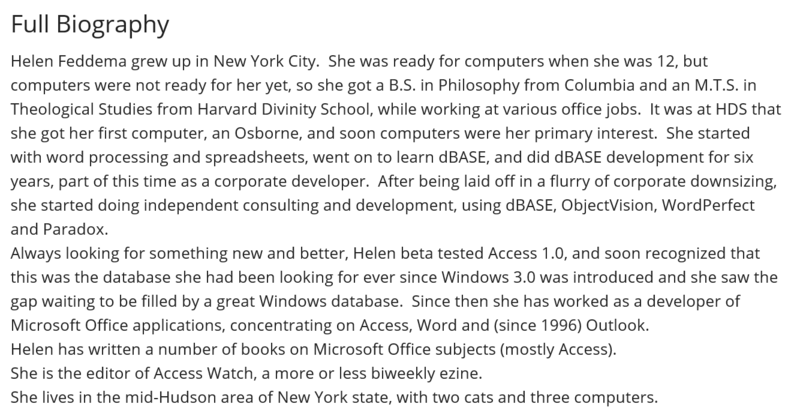 (That is one reason you want to read at least 30 Excel client testimonials. What does the client say, not what the so called Excel consultant says). How much do they lie, well, for example I chatted with a new firm on the internet that started their business the prior year. In the online chat they said they had thousands of clients. When I asked how that was possible when the firm was opened in the prior year, this person became enraged. He was upset that I researched his new company, and that he was caught in a blatant lie. It literally happens all the time. So yes, that puts you at a huge risk. Hence the value of a firm that has ongoing Microsoft certification, look for at least one or two decades, the longer the better. 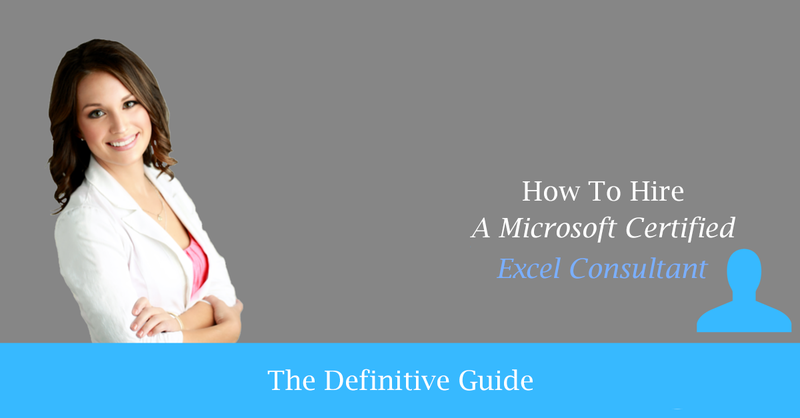 If you want to hire a qualified Microsoft Excel consultant the first time, be it us or one of our favorite competitors, such as Debra of Contextures or for a Microsoft Access consultant, Armen of J Street Tech, follow The Definitive Guide To Hiring A Microsoft Excel Consultant. Microsoft Certified Partner – Silver/Gold Application Developer. According to Wikipedia: a Microsoft Certified Partner (MCP) is a firm that provides Microsoft-related products or services, or support for such. … They are confirmed by Microsoft to be official, and that they work effectively, and help customers with a range of information technology (IT) projects and specific products and services. Thousands of our clients have worked with our staff of Microsoft Excel, Access, Office, SQL Server, and Power BI experts over the past 23 years of operation (Note, not 23 years of experience, but rather over four decades of experience, 23 years as a corporation based out of our corporate office in Irvine California). According to Wikipedia: According to Microsoft, Microsoft Most Valuable Professional (MVP) award is given to “exceptional, independent community leaders who share their passion, technical expertise, and real-world knowledge of Microsoft products with others. Thousands of our clients have worked with our staff of Microsoft Excel, Access, and Office MVP’s over the years. Here is a link to Jacob’s Microsoft Excel MVP Certification page on the Microsoft website. Jacob is one of the Microsoft Excel MVP’s that have helped thousands of our clients with their Microsoft Excel consulting needs over the years, as well as programming in the rest of the Microsoft applications (Microsoft Access, SQL Server, Office, Power BI, Mac and VB.Net), all at the expert level. Having the Microsoft Corporation hire you for your Excel consulting services repeatedly is another form of certification. So while not a formal form of Microsoft certification as the others discussed in this post, it is an informal form of certification. It certifies that your Microsoft Excel consulting services are good enough to be used by the mother ship, Microsoft, and good enough to be part of the Microsoft Excel application on your computer, the person reading this post (You). As discussed above, Microsoft hired us to build many of the Microsoft Excel 2013 templates that are part of the Microsoft Excel application you are using (2013, 2016), they are also available for download on the Microsoft website. Microsoft also hired us a few times to do Microsoft Power BI programming work that would be used internally at Microsoft, to run their operations. All of our work for Microsoft was done by our Microsoft Excel MVP’s, as many of the Microsoft Excel MVPs are seen as the elite. So as you can see, that is a huge testament to the value of our Microsoft Excel programming skills. That is just one of the many things that set us apart from the other firms in this space, Microsoft hires us when they need Excel programming help. Red Bull is the best known client where we were hired to replace the work done by one of the firms with less skills and experience. The work that they did was so bad that Red Bull had to reach out to us to have us do the work the way it should have been done the first time. And Red Bull did not receive a refund from the other Excel help company out of New York. So you see this happens to big companies just as often as it happens to smaller companies. (See our Red Bull testimonial below). 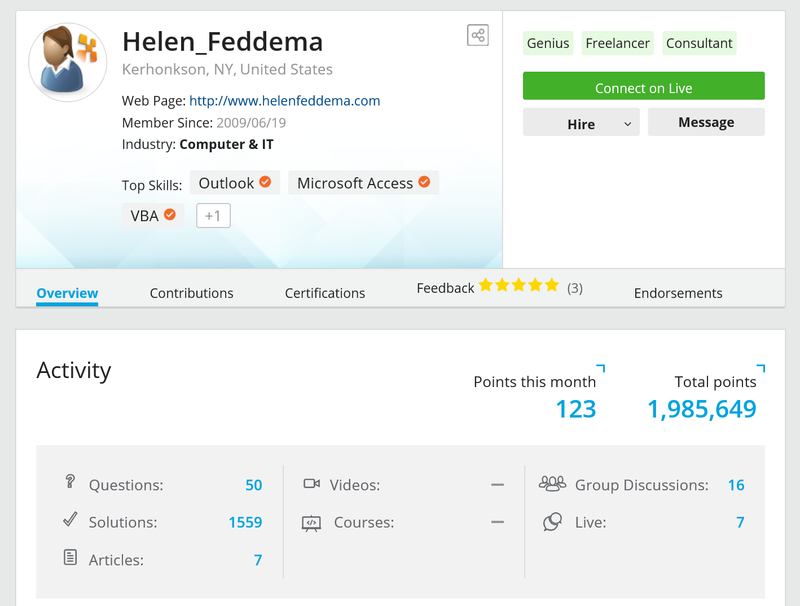 According To Wikipedia: Experts-Exchange.com (EE) is a website for people in information technology (IT) related jobs to ask each other for tech help, receive instant help via the application experts, such as our Senior Access, Word and Outlook consultant, Helen Feddema, answering technical questions via the forums. If you would like to have the comfort that comes with hiring a corporation that has been a Microsoft Certified Partner for the past 23 consecutive years, one where the Microsoft Excel consultant you work with is a Microsoft Excel MVP, one that does Excel consulting work for Microsoft, please reach out to us so that we may discuss your Microsoft Excel, Access, Office, SQL Server, Azure and Power BI consulting needs with you. Or if you like, stop by our Irvine California office for a cup of coffee to go along with our conversation. The call is free, the consultation is free, the estimate is free, and the only risk you have is in not calling us first. Posted on May 5, 2017 Posted in Blog Category and tagged Certification, Experience, Microsoft.